What makes the best dog food for senior dog's? As your dog starts to age, it is vital to understand how to find the best dog food for senior dog's. The right food will help them manage their weight as their metabolism slows down, support their joints and their immune system. The quality of dog food they eat will impact how they age and how they enjoy their golden years. At what age is my dog a “Senior”? Whether your dog is a “Senior” or not depends a lot on their size and breed. Giant breeds like Great Danes, Dogue de Bordeaux, Saint Bernards and Bernese Mountain dogs are senior dogs from 5 or 6 years old. Small dogs like Jack Russells and Chihuahua live the longest and are not seniors until they are over 10. Most dogs are seniors by around 8-9 years. This includes breeds like Labradors, Staffys & Border Collies and Beagles. Do senior dogs have different nutritional requirements to adult dogs and puppies? There are officially only different nutritional requirements for puppies and adult dogs, not a specific profile for senior dogs. Most dog foods specially designed for seniors are more about weight management and marketing. The best dog food for senior dogs can also be great for adults and puppies. This is how we have designed Scratch. If your senior dog is overweight or obese, the most important thing you can do for them is getting their weight back to normal. Dogs that are overweight or obese die on average two years earlier than dogs at a healthy weight. That is a lot of time you miss out on together. Most commercial dog foods designed for weight management just include more fillers to make you feel like you are still feeding them enough. This can even be by adding sawdust! (appears as “Powdered Cellulose” on labels). At Scratch, we take a different approach. If your dog needs to reduce weight, we help you by providing specific feeding instructions and a measuring cup scoop to make sure you feed the correct amount. Being overweight is also a significant cause of joint pain for older dogs. Getting them back to a healthy weight is the best treatment. The best dog food for senior dogs will also have good levels of omega 3 fatty acids (from cold water fish) to help reduce inflammation. Scratch uses Tasmanian Salmon Oil at the primary source of omega 3 as well as Turmeric to combat inflammation. While glucosamine and chondroitin supplementation are touted as being great for joints, there is little scientific evidence to support this in dogs. There is evidence that Green-Lipped Muscles help. The issue with including this as an ingredient in senior dog food is that it is very temperature sensitive and easily de-activated. It is best to use freeze-dried Green-Lipped Muscles as a treat or powder instead. This way you also know exactly how much your dog is getting. The best dog food for senior dogs will also focus on supporting their immune system. The keys to this are good quality sources of animal protein, zinc and vitamin C. Protein is crucial as it provides the essential building blocks for muscles, organs and the immune system. Not all protein is created equal. Dogs do better on high-quality animal protein. The best dog foods have a specific animal protein as the first ingredient and no cheap plant-based concentrated protein. Zinc and vitamin C also supports critical immune functions, act as antioxidants and help to keep your dog’s skin healthy and coat shiny. After obesity, dental diseases is the most common health problem for the modern senior dog. Mature dogs that have not been getting raw bones and dental treats or toys to chew on – or regular tooth brushing and cleaning are likely to have dental disease. This can make their mouth sensitive. They may also have missing or removed teeth that make it harder to chew. If your senior dog is not enjoying their dry food anymore as it hurts their mouth, add some water to it to soften it. Pet parents around Australia are switching older dog's to Scratch. 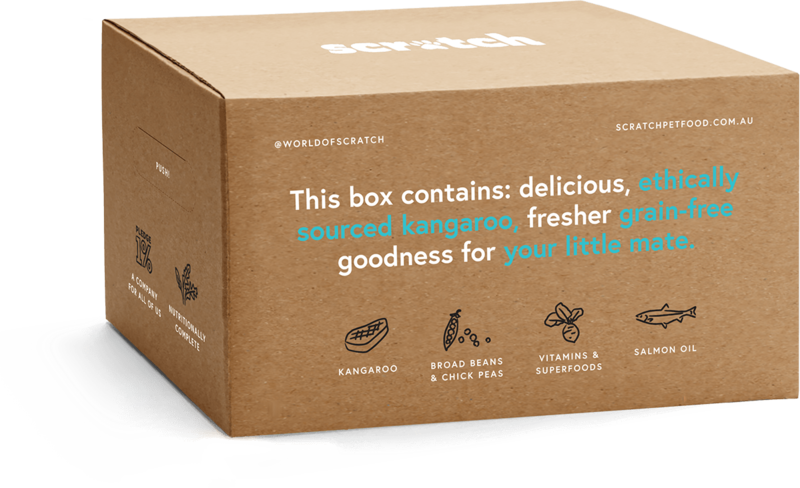 We said no to dog food stores and hello to real ingredients, made fresher on subscription and delivered to you. Our Scratch dog food is a premium senior-friendly food with easy to digest ingredients that are friendly to the common allergies. Dog's on Scratch have reported healthier coats, better energy and even healthier poos. There are some diseases like kidney disease or pancreatitis that senior dog's can get that do need a tailored diet. It is best to discuss these situations in detail with your vet. Processing high amounts of protein is thought to put too much stress on diseased kidneys. Most vets will suggest a diet lower in protein than Scratch’s 28% if your senior dog has kidney disease. It is important to get specific advice from your dog’s vet if they have Kidney problems as they still need all the essential amino acids from protein to stay healthy. If your dog has had pancreatitis, they will generally be prescribed a low-fat diet. Scratch has 15% fat which usually is a great energy source. Vets often suggest a diet below 8% fat(on a dry basis) to avoid getting pancreatitis again.